Brought up in the East End of London, David Gold started out helping his mother sell buttons from a stall outside their house. Moving indoors they then converted their front room into a card and sweet shop. From there, he went on to run a book kiosk in Charing Cross, and before long branched out into publishing, printing and distribution. Looking around for a new challenge, David recognised the huge potential of the Ann Summers concept. It was soon added to his portfolio and now with the help of his two daughters, Jacqueline and Vanessa, it has become one of the biggest success stories in British retailing. It currently has 145 stores with an annual turnover of over £150 million. As Ann Summers went from strength to strength, it gave David confidence to start up an even riskier venture: a newspaper. The Sunday Sport was born and quickly established itself to such an extent that David and his business partner, David Sullivan, were able to make it an equally successful daily newspaper. 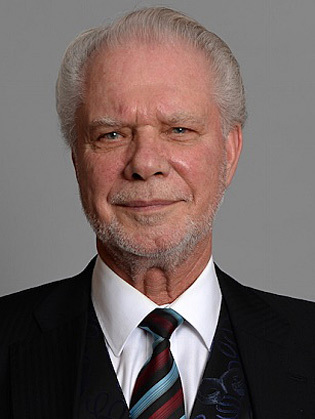 With his great acumen, and punishing work schedule, there was nothing that David Gold wouldn’t do to ensure success. Keen for others not to benefit from flying him around Europe to meetings, Gold Air International was set up, chartering jet travel to the rich and famous. But the greatest passion in David Gold’s life is football. His love affair with the beautiful game dates back to having played for West Ham as a schoolboy and being offered an apprenticeship. On this occasion, his father who ordered him to finish his apprenticeship as a bricklayer cruelly denied him the opportunity but his desire to be involved in the game never waned. David joined forces with David Sullivan to steer Birmingham City Football Club from the verge of bankruptcy and relegation to the Second Division in 1993. They appointed Karren Brady as Managing Director, and transformed Birmingham City FC into one of the most shrewdly run football clubs in the country, securing promotion to the Premier League at the end of 2001/02 Season. David’s continued love affair with the game saw him and Sullivan sell Birmingham City for £82.5 million in the autumn of 2009 and buy a 62% stake in West Ham United, bringing Brady with them as Vice-Chairman, pledging to guide the club out of the financial turmoil that it had experienced in recent years. Between them, they now control 85% of the shares. David has been a fixed wing pilot for 40 years and a helicopter pilot for 10 years. David won the Gozo Beacon in 1979 and was twice winner of the prestigious International Malta Air Rally in 1981 and 1982 as well as runner up on three other occasions.